I did decide to leave the solar panel and battery behind, which was a good call. Our camera batteries easily last a full day, so it wasn’t necessary. I also could have done without the guide books (I did so much research ahead of time I didn’t need to reference them) and the folding keyboard (I didn’t have time to blog while travelling so I didn’t use it). Other than that, I needed everything else. Oh! 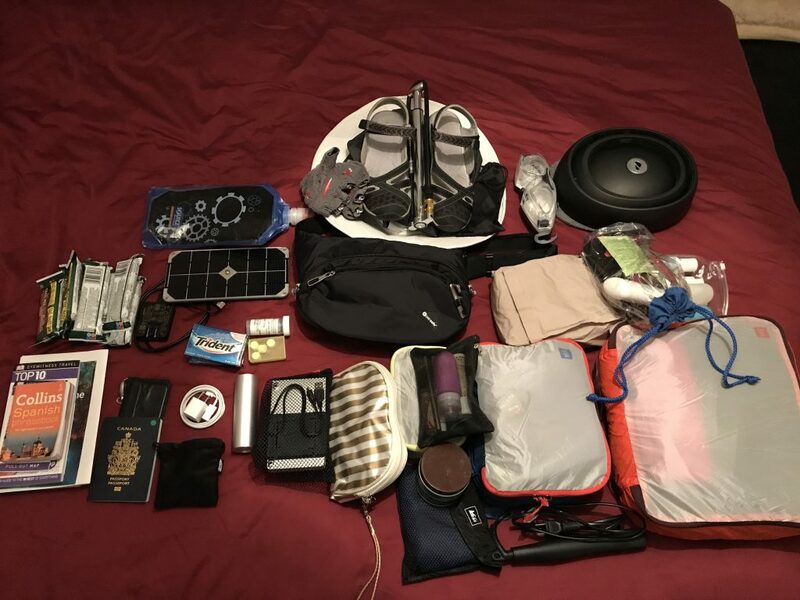 You probably noted the packing cubes in the photo do not look like they hold two weeks worth of clothes. That’s because they don’t. We brought laundry detergent and hand-washed items throughout our trip, but that’s what you gotta do to travel light! Brompton has a new travel bag that I want so bad! It solves all the problems I have with the B bag, which are: 1) Two wheels are insufficient for rolling (new bag has four), 2) It’s difficult to pack down (new bag packs flat), and 3) It doesn’t provide enough protection (new bag has plastic boards inside). Deflate tires. Some people say you don’t need to do this, but why take the risk? It’s not that hard to pump them back up when you land. Remove C-clamps and put them in zippered pouch inside B bag. 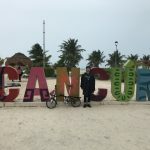 When we landed in Cancun, we caught an ADO bus downtown, then found a quiet corner of the bus station and unpacked in just a few minutes. Check-in baggage people usually recognize our Bromptons as bicycles, but none have charged us the extra bike fee since the bikes in the B bags fit within regular checked luggage size and weight. They simply put FRAGILE stickers on the bags and direct us to the Oversized/Fragile area. 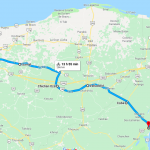 However, at our destination often the bags come out with the regular luggage (as they did in Mexico). But this time when we returned to Canada, the bags came out in the Oversized luggage area. 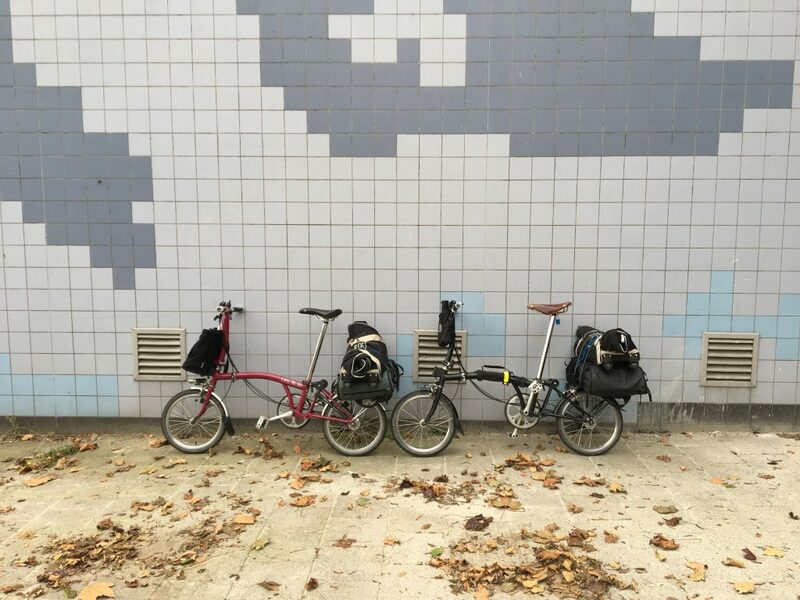 So we always have one of us in each place, because you never know on which conveyer belt the Bromptons will appear! 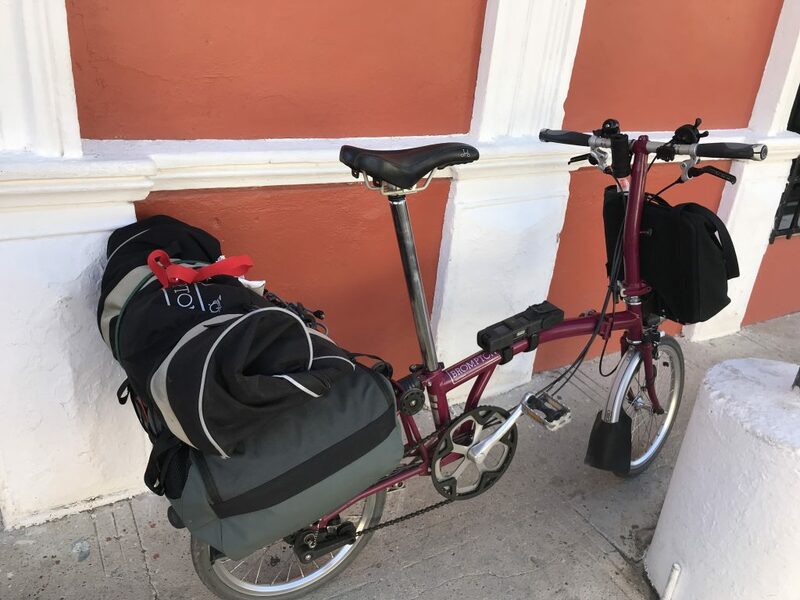 The first time we travelled with the Bromptons (to Cuba in 2013), all we had were 20-litre O Bags and our B Bags rolled onto our back racks. 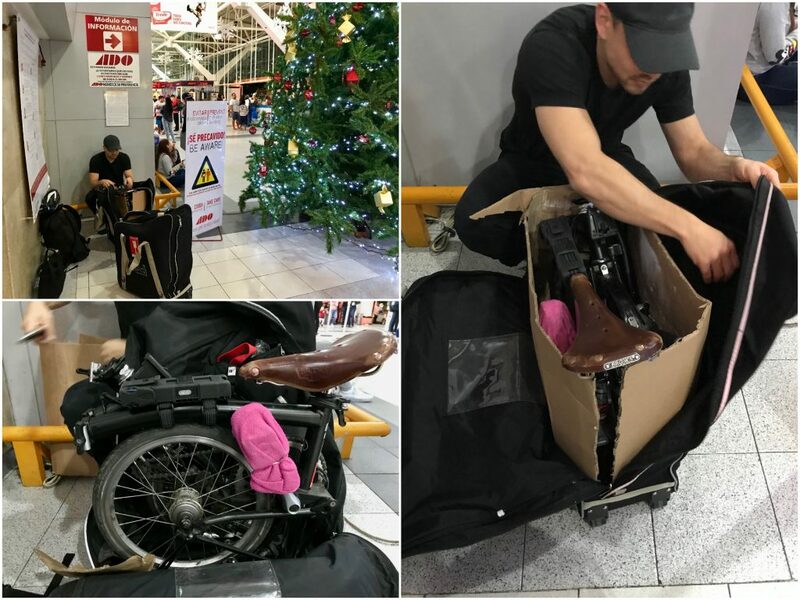 You can read more about that in this post: Brompton Packing Test. But suffice to say that set up wasn’t perfect. Since the O Bags are too small to fit everything, we put our clothes in the B Bags. This is fine if you are only cycling and not also hopping on other means of transportation. 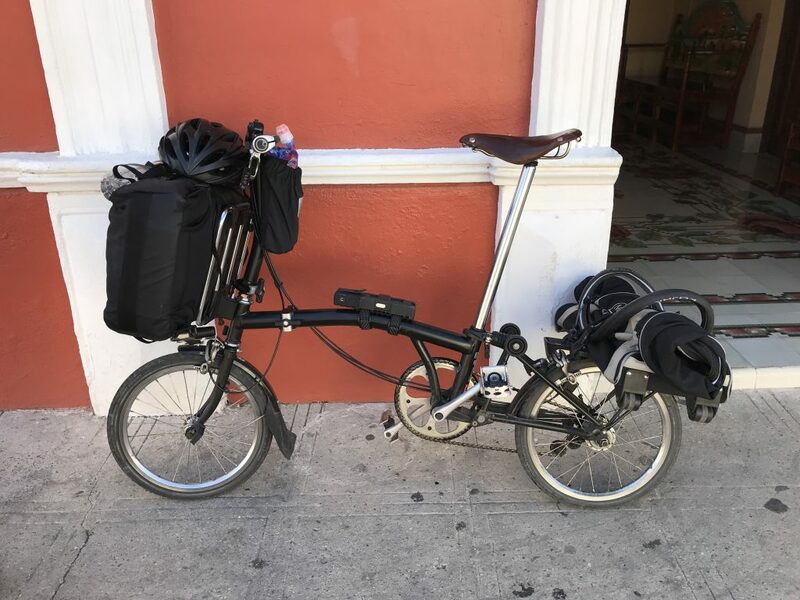 However, in Mexico we’d be taking a couple buses, which meant we needed to pack our bikes in the B Bags, and that’s easier if the B bags aren’t being used to transport other stuff. Since Brompton’s big 31-litre front carry bag doesn’t work with our S-style handlebars, we bought 30-litre backpacks. For our trip to The Netherlands, we strapped these backpacks to our Brompton back racks, and tied the B bags on top. … but in an effort to not be so back heavy, next trip I may try putting my big backpack on the front block too. 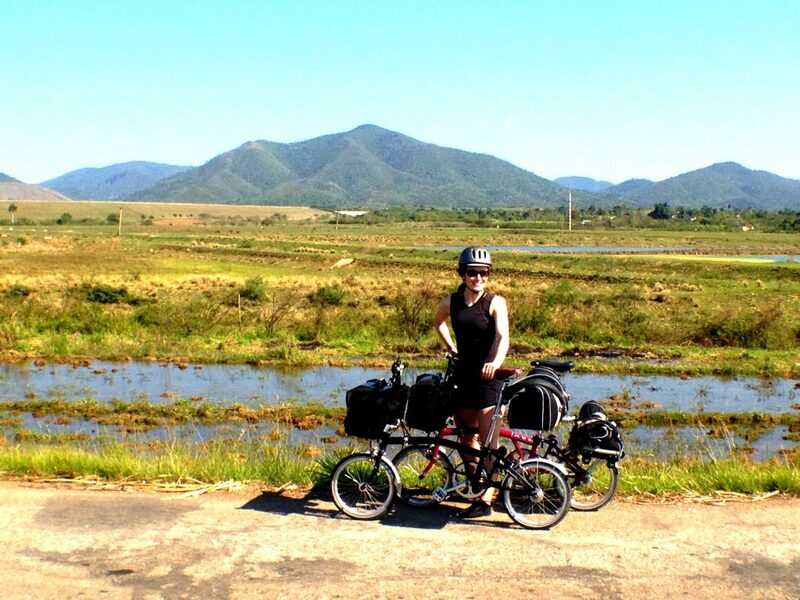 Thanks for the story, it’s great to see other people’s Brompton ideas. I’m pleased to hear that the B Bag has been improved, because we discovered all the problems you listed when we first tried them a few years ago. We have moved onto B&W Foldon, but if I get sick of these it’s good to know the B Bag might be worth trying again. Is that a folding helmet I see in your gear? How did it go?? Yes, that is a folding helmet! It’s a Clocsa. At first I thought it looked kinda funny and fit tight, but it was on sale so I got it. Now I LOVE it! Not only does it pack down flat (perfect for traveling), but it’s comfortable and light too.